He may not be the last of the Mohicans but his genes reveal the lasting tenacity of that great Native American nation. 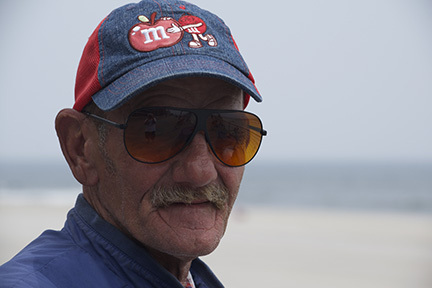 He’s known as “Montauk Man” or you can just call him, “Ed.” He’s half Native American, of Mohican extraction. I was riding my bike West from the East end of the Long Beach boardwalk to my preferred Top Hat Barber Shop in the West End. I spotted an interesting figure. He was at the rail, facing seaward with a pair of binoculars. I was intrigued so I pulled alongside. His weathered brow pressed to the scopes’ rims as he peered out over the ocean. I asked if he saw any whales. He said he didn’t, that it was too hazy. “Can’t even see the ships,” he said. “Yes,” I agreed. I asked about his unusual bike, it was fitted with a plastic bin on the back with a huge air pump underneath. The pump seemed to have the fill-capacity to inflate a block-party’s bouncy house in minutes…if it was manned by an energetic soul. Montauk Man is such an energetic soul, he’s a biker, not a Harley-Hog guy but a bicycle enthusiast. 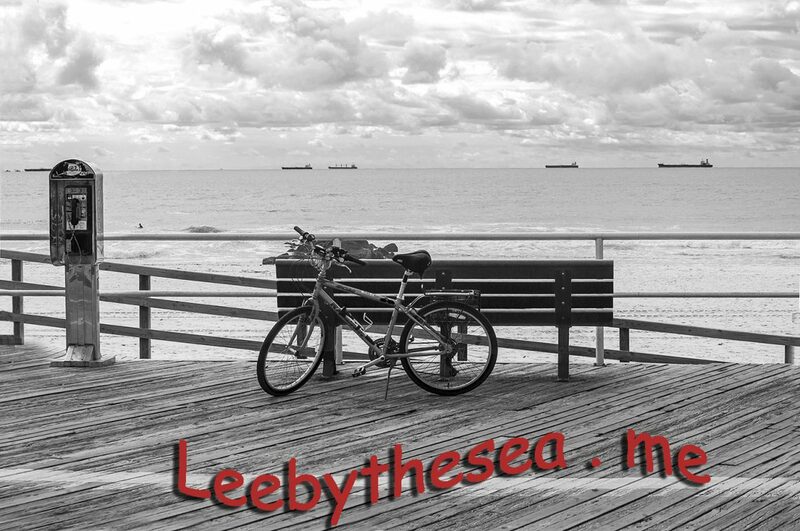 He biked to Long Beach that day from East Islip, where he said he lives, a trip of about 50 miles one way. He’s peddled our 2.2 mile boardwalk 200 laps. 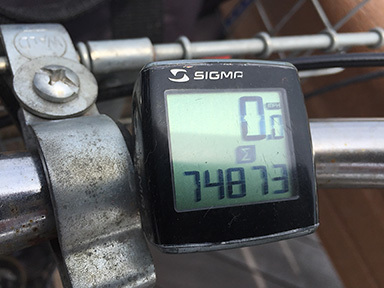 He has an odometer on this bike, it stood at 74,873 miles when I saw it. He’s completed enough miles to have crossed America’s amber waves of grain twenty five times. All while jockeying our planet around the sun for 70 revolutions. He’s retired now, after working decades making BX cable, the old metal-encased wires that were used in America’s earlier decades. He’s now enjoying retirement, his way, biking this Northeast shore of America. Yes, our Independence is to be celebrated. It was the fantastic birth of a new nation, and celebrate we do. But for those who were “discovered” as this land was settled it was the loss of their own nations. The various Native American nations were reduced by the civilizing process, the process that formed America…from sea to shining sea. Sure, I join America in the waving of flags as we honor those who fought to free us from the King’s dominion. And I join heartily again in honoring those who served and those who are buried in reverent rows beneath America’s soil. Those who died in so many wars since that revolution so that we may keep our sacred freedoms. So many brave souls beneath America’s soil. So many reasons to remember them. 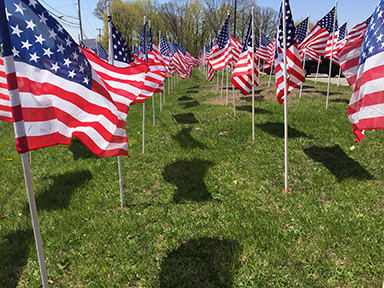 Flags, on grounds of NY’s SCPD, 1st Pct. But as I celebrate I can’t help but think of those Native Americans who trekked these paths before we paved them, who hunted bison and gathered grain long before we hunted jobs and gathered credit cards. 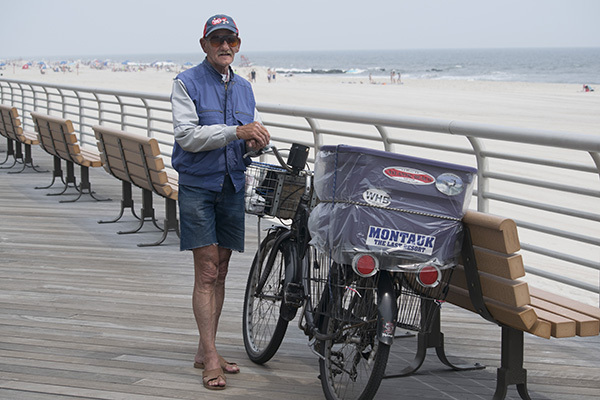 Montauk Man has that handle because he also rides his bike from East Islip to Montauk Point, a 246 mile round trip. It takes him 16 1/2 hrs going through 36 towns. He does this five times during the course of the year, the first ride after the July 4th weekend, the last in October. This year he’ll be leaving on July 6th. Ed peddled off to East Islip as I peddled off to the Top Hat Barber shop. I soon returned home to this computer…for a well deserved rest…after my five-mile trip. Have a Great, Full, July 4th. Please keep in mind all who served. Oh boy, such very nice words, thank you so much. It was a pleasure meeting you as well. You had so much to offer in the way of cameras, lenses and law. I do converse with many people on the boardwalk and beach and you are among the many I will always remember. I did post a new blog just now, “New Eyes.” It speaks of speaking. We seem to have become a “safe” society, unwilling to naturally reach out and touch others. Often we are the poorer for it. But I have hope, eternal hope. Thanks again for those great words of support, Stratos. Maybe I’ll spot you again soon with that way cool camera on your…Good Path. I spoke with you yesterday and made sure to check out your blog. You have done an amazing job crafting this little niche of the internet. I’ve been thoroughly enjoying reading your tales and very impressed with your writing style. Your passion for life in all its different forms shines through with each posting, and especially face to face. I happen to agree with your stance on the subjects you’ve brought to light. I’ll certainly be checking out your blog from now on. I’m very glad to have met you and have told a few family members and my girlfriend about the charismatic Lee by the sea. Hi Lee finished a painting today of a photo I took at the beach. You are in it. Accept my friend request on Facebook so you can view it. Great meeting you as well, Janine. I’ll look for your work online and I’ll send you a few photos in emails. Hi Lee It was a real pleasure to meet you on the beach today. I have had an opportunity to read your last two posts so far and I love your style of writing. I most definitely will be looking for Montauk Man every time I venture to the beach and look forward to reading more of your posts.